Regular exercise is an important part of leading a healthy lifestyle. If you’re a beginner or returning to exercise after some time out, it can be hard to know where to start. But it may be easier than you think. Here we give you tips and advice for how to start exercising. It’s also important to do some regular exercises to improve your range of motion. Flexibility exercises involve slowly stretching your muscle groups without jerking or bouncing. Do some simple stretches to get your body moving at least two or three times a week to stretch all the major muscles in your upper and lower body. You can do these in your front room and they’re a great way to get started. If you would like to read about the exercise guidelines for adults over 65, see our information on: Exercise for older people. There are plenty of ways to pack activity into your week so you’ll probably reach the target before you know it. Here are some sample exercise routines to achieve them. It’s a good idea to set some goals when you start exercising. Think about what you’re aiming to get out of the effort you’re going to be putting in. Making your goals SMART can help you. Specific – say exactly what you will do. For example, you’ll go to the gym twice a week before work. Measurable – if you can’t measure your goal, you won’t know if you’ve achieved it. For example, if you ride a bike, time how long it takes to cycle a set distance and keep track of how this improves. Attainable – your goal needs to be something you can and are willing to do. Although ‘I’ll run a marathon by my next birthday’ is admirable, if you’ve not run before and don’t enjoy it, it’s unlikely to happen. Why not sign up to a 5km in three months’ time instead? Realistic – something you can do with the resources you have. Although it might be nice to have a personal trainer, perhaps a group exercise class is more in line with your finances. Time-based – give yourself a sensible timeframe in which to meet your goal. For example, try to be able to swim a mile after a month of regular swimming sessions. Having goals is also great for reminding yourself how much you’ve improved and tracking your progress – think how great you’ll feel if just a few months after you start jogging, you can complete a 5km run. Keep a record of your exercise and remember to celebrate your progress achievements – big and small. If you’re put off by the thought of exercising at first, choose an activity you know you’ll enjoy. There are lots of different types of exercise to choose from and you don’t have to go to the gym to get the health benefits of exercise. It can also be helpful to join a group of like-minded people, such as a running club or football team. If running puts you off, try an aerobics or dance class instead. Or perhaps yoga or tai chi is more your style? Start small and have a go at a few things until you find something that suits you. Over time, exercise will become more of a habit and a part of your routine. We’ve put together some of our favourites to give you ideas – both moderate and vigorous intensity depending on how energetic you’re feeling. Take a cycle around the park with the family. Go for a brisk walk – make it more interesting by listening to some new music or a podcast while you walk. Go for a game of badminton with friends. Try aquarobics – it’s a good activity for everybody as the water supports your weight. Go for a bike ride – for a moderate level of exercise, stick to a steady pace below 10 miles per hour. Play an active game with your kids or grandkids. Gardening – mow the lawn to make your outdoor spaces look enticing. Head out for a day hiking in the country. Have a clean-up such as vacuuming – it all counts! Go dancing – it doesn’t have to be a formal class, put some music on and dance around the living room. Take on your friends in doubles tennis. Try out a skipping rope. Swimming – try having a go at front crawl to really get your heart going. Aerobics will get your blood flowing. Hockey – this can be a great social opportunity. Cycling up hills – to keep going, think of the sense of achievement you’ll have once you reach the top! Basketball – you could sign up to a league. Football – another great social sport. Shovelling or carrying heavy loads – get your jobs done and a good workout at the same time. Go rollerblading or ice-skating at a brisk pace. Try lifting some weights in the gym. Play singles tennis for a more intense workout. Once you’ve chosen an exercise you enjoy, you need to stay motivated and stick with it. The following may help. Put your goal on paper and stick it on the fridge so you have a constant reminder of what you’re aiming to achieve. Use mobile phone apps to measure your progress. 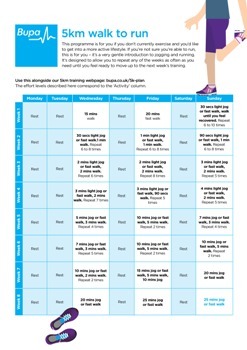 Structured exercise plans as well as personal trainer apps are freely available. Make a structured plan to follow. We have a range of running training programmes for different distances – if you’re just starting out, try our walking programme or ‘walk to run’ 5km plan. Bring out your competitive spirit. Enter yourself into a charity run or obstacle race so you have something to aim for, or join a sports league that has regular fixtures. If you’re still thinking you can’t possibly fit activity in to your lifestyle, you might be surprised by what you can achieve. See how easy it can be in an average week for a working person who commutes to the office. This example shows you can smash the target, just in everyday life! If you have a health condition, such as osteoarthritis and back pain, it’s understandable if you feel anxious about exercising. But actually it’s usually best to keep active to help treat your symptoms. Research has shown that if you have osteoarthritis in your knee, exercise reduces pain and improves how well your knee joint works. It’s also shown that it might help with hip pain too, and possibly with how well your hip joint works. You might prefer to start with strengthening exercises and build up to something more lively that gets your heart rate up. Both of these are thought to be better than bed rest or steering clear of activity. Walking is very safe but if you have specific concerns about health conditions such as osteoarthritis, ask your physiotherapist or a sports physician about what you can and can’t do. They can recommend the activities and exercise that are most suitable for you. And remember, any amount of exercise is good for your physical and mental health.